COLORADO SPRINGS, Colo. -- Four people are dead, including a suspected gunman, following a shooting spree in Colorado Springs on Saturday. Lt. Catherine Buckley says officers were responding to a report of shots being fired when they spotted a suspect matching the description of the person they were trying to find. Buckley says the suspect opened fire, and police fired back. CBS affiliate KKTV reported police were originally called to North Prospect Street at 8:45 a.m. on reports of gunshots. They found a deceased man sprawled on the side of the street, his backpack still on his back. 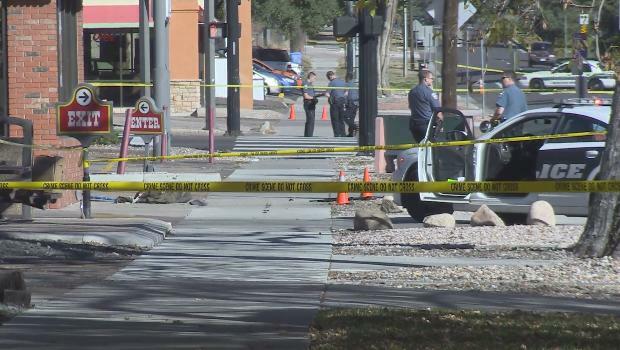 Multiple witnesses told KKTV the suspect went on a shooting rampage in the minutes leading up to the gun battle with police outside a Wendy's. "I looked out my kitchen window and I saw a man in a green jacket firing an AR-15...waited a few seconds, went out my house, looked to my left and saw a man down the street, probably 50 feet. I started calling him and I called the cops," witness Matt Abshire told The Colorado Springs Gazette. While waiting for Colorado Springs Police to answer, Abshire kept tailing the suspect. "Still following him, he's heading left on Platte towards Palmer High School... probably a hundred yards past El Paso Street, he stops, turns to his left, fires four shots, shoots two ladies, one in the jaw, one in chest if I'm not mistaken." Abshire told The Gazette he rushed to help, but that one of the victims was already dead. Police confirmed Saturday afternoon that both were killed. Abshire said the officers encountered the gunman a moment later. Alisha Jaynes told KKTV she was at an ATM when she saw a man with a gun walking calmly down the street. "They yelled, 'Put the gun down,' and he turned around, and that's when they shot at him a good 20 times," she said. "There was a lot of gunfire." Buckley says the crime scene covers several major downtown streets. Those streets have been shut down while investigators try to figure out what happened. No details were available on the other victims or how they died. Buckley says the investigation of the police shooting has been turned over to the El Paso County Sheriff's Office. El Paso County sheriff's spokeswoman Jacqueline Kirby says there are at least three crime scenes.